It must be time for some fun. I am truly a little bored of this dreary, cold weather. Whenever I think I spot a sign of spring, boof, hopes are dashed and winter smirks and says he is hanging around a bit longer. Still, there is no reason to let the weather get the better of us. I have been thinking for some time of getting back into entertaining mode and out of my cosy winter hibernation. Somehow it feels time to get friends over, crack open a few bottles alongside some good food and sit around the kitchen table chatting about this and that. I have always loved those little bits to eat with drinks before lunch or dinner, but what to call them? Canapes sound a bit smart, like those goodies that appear at weddings and grown up drinks parties, little rows of beauty, identical and perfectly crafted on slate or mirrored plates. Not, in all honesty what you should expect at my house. Snacks sounds like something you might have when you get in from school and hors d’oeuvres seems old fashioned and I think is actually a starter rather than what you might have before. Amuse bouche are those treats you get unexpectedly in restaurants and not what I mean here so, bits to eat with drinks it will have to be. I adore being offered something before supper, not only from the greedy point of view but because it is a good idea when drinking. Lunch always seems a distant memory and I’m not keen on the first glass of wine splashing down onto an empty stomach – I know how it will make me feel tomorrow… More than this though, it starts the feast before you even get to sit down. Perfect. Onion tart is a regular offering from me, slow cooked melting sweet onions, criss crossed with salty savoury anchovies is superb pre-lunch and I have a tip top recipe I will post soon. Cheese biscuits whilst simple in the extreme provide the necessary crisp bite – a recipe for these too will follow. The crostini here are a current favourite, the irresistible taste of artichoke combined with zingy lemon and chilli work very well on a bit of crunchy toast. A gentle garlic hum in the background and lots of verdant parsley add to the picture. Sometimes I put this on the table in a bowl with a pile of toasted sliced ciabatta or ficelle – alternatively I might pile up the artichoke onto the little croutes and hand them around on a plate, as ever, it’s up to you. Put the drained artichokes, garlic, chilli, parsley, lemon zest and juice in a bowl or jug and blitz with a hand held blender (or chop it by hand and mix). Now taste it, you may need more chilli or lemon juice as it is important to have both heat and sharpness. Season with salt and pepper. 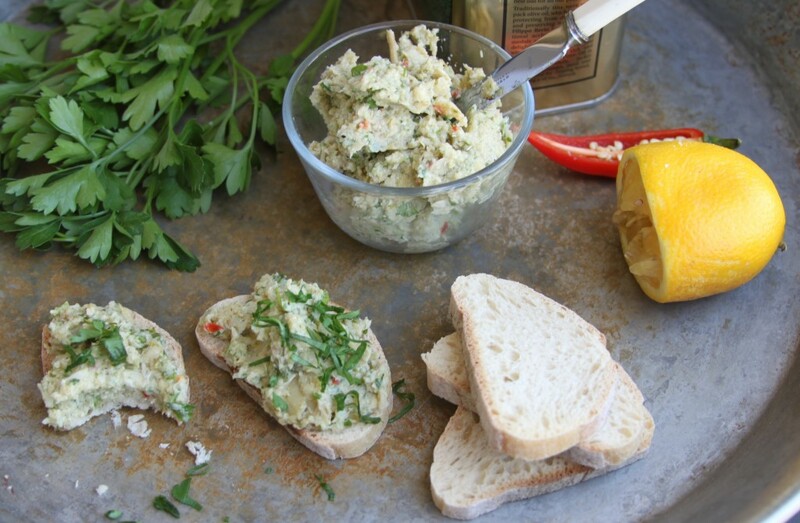 When you are happy with the taste, spread the mixture onto toasts or decant into a nice bowl. Either way pour a little good olive oil over just before serving. Depending on the size of your toasts, this will probably make about 12. Mad baking today to get REDy (ready) for tomorrows cake stall at school in aid of Comic Relief. 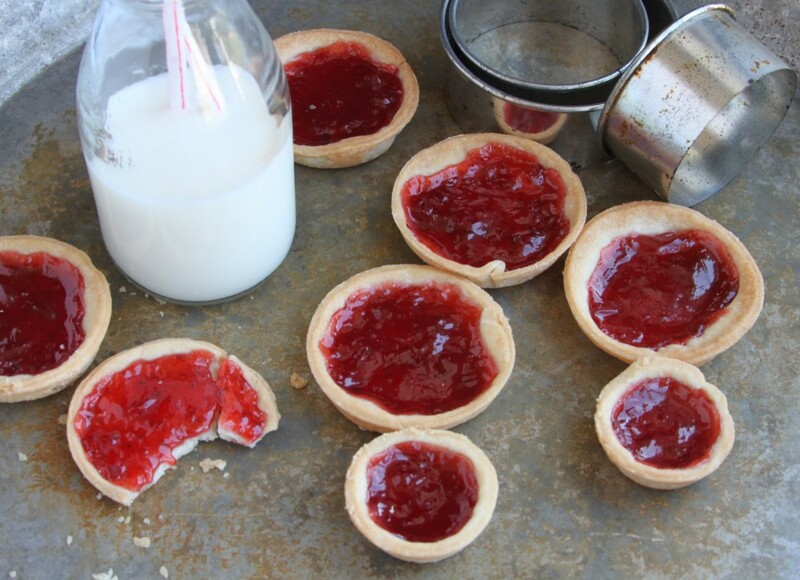 I thought jam tarts were suitably round and red and it is easy to knock up a couple of trays of them. I have also been painstakingly extracting all the red sprinkles, smarties, hundreds and thousands, chocolate beans etc from their mixed colour packets going almost cross eyed in the process. These I will strew over a large chocolate icing covered cake to be cut into squares and pressed into hot little hands tomorrow in exchange for cash! 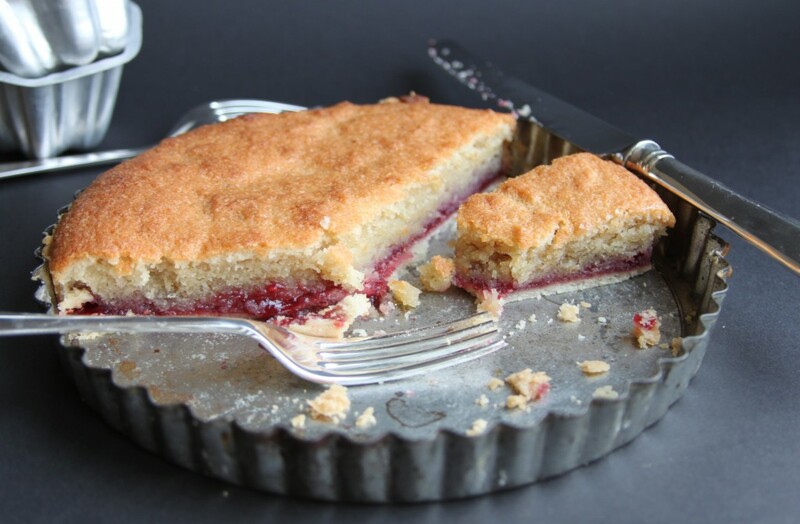 I am sure you don’t need a recipe from me for jam tarts but just in case, either buy your pastry or use the recipe I gave with the Bakewell Tart (March 2013). Use it to line the holes in a bun tin, add a teaspoonful of jam and cook at 180 for 10 minutes then 150 for a further 10. Comic Relief do an amazing job and though the proceeds from our cake stall may be but a drop in the ocean, it all helps and it is fun to join in. Enjoy your Red Nose Day! There I was last week with my washing out on the line thinking hurrah, Spring is here. The sun was shining, it was positively balmy outside and our chickens were sunbathing. How Mother Nature must have laughed as the cold wind set in and last night, when it started actually snowing, her sides must have just about split. So, here we are again, chilly. Putting the layers back on and discussing the weather endlessly as only the British can. I have put on hold the “Here is Spring” recipe I had planned and reached once more into my cache of cosy, winter warmers. I don’t mind this at all, soups, stews and roasts are all most welcome at my table and I know I will miss them when the warmer weather does arrive. That lovely day last week was just a tease, a reminder of what is in store, a real here today and gone tomorrow. Anyway, this was our pudding yesterday for lunch. Not only warming and a tiny bit stodgy (in a good way) but also an absolute breeze for my children to make for Mothering Sunday. It was delicious and I was very lucky to be presented with it. Warm custard or double cream, either or both compliment this superbly and if there is any left, it is just the ticket with a cup of tea. Whizz together (or rub in by hand) the first five ingredients and then cautiously add water, a few drops at a time until the pastry just comes together. Form into a ball, flatten, wrap in clingfilm and leave it to rest for 20 minutes. Preheat the oven to 180 and put a baking sheet on your oven shelf to heat up. Mix everything except the jam together really well. Once the pastry has rested, roll out and use to line a 20cm tart tin with a loose bottom. Bake this blind for 15 minutes. Leave it to cool for a few minutes and then spread the jam evenly over the tart case followed by the almond mixture. Smooth this to cover the jam and then cook for 25 minutes. You could dust with icing sugar if you like or just serve as it is. This is enough for 4 with a couple of slices left over for tea. Note – please do use bought pastry if that is what you prefer and also, if you can’t bring yourself to use lard just replace it with the same amount of butter. I have a vague memory of beetroot in a white sauce. I don’t recall if it was a recipe I saw or just a mention but it stuck in my mind as it must, surely, be an oxymoron. Can you imagine beetroot in a white sauce, it is not possible, the sauce would of course turn pink. Barbie pink I imagine and there you would be with a pink sauce containing darker pink lumps of beetroot, extraordinary. The more I think of this the more I wonder if it was just a strange dream, surely it can’t have been a real recipe, although it does have a ring of the 70’s about it when all vegetables at one time or other were blanketed in a white sauce. Anyway I don’t think I have ever eaten such a thing but I know it took me a while to come around to this vibrant coloured root and yet now, I can’t get enough of it. At school the beetroot was bright purple, usually hard and skidded around as you tried to cut the regulation sized orbs. It was soused in a vinegar so astringent that it made you cough and I remember girls drinking this in abundance believing it to be a tremendous weight loss aid. The coloured juice seeped into everything else on your plate along with its sharp dressing and was entirely uninviting. After school I managed to avoid beetroot almost entirely for years, eating it only when required to be polite and puzzling at the earthy taste and its ability to turn your wee pink. So what happened, did I grow up, is it something to do with having children, embracing vegetables as never before? I now love it and seem to cook it every week, either chucked in the oven with other root veg, say carrots or Jerusalem artichokes and eaten simply with a roast chicken, green salad and my beloved garlic yogurt. Or cooked, then peeled and put in a salad, maybe with feta (Beetroot and Feta Salad, Nov 2012) or whizzed in a soup. I had thought to make this weeks soup into something jazzier with ideas of adding this or that. 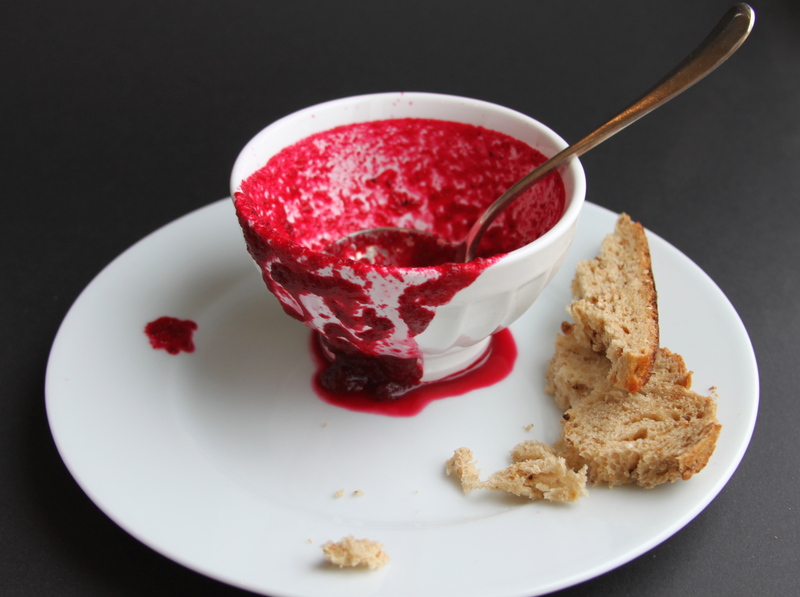 In the end however, I decided to keep it simple so that the earthy sweet taste of the beetroot shines through and along with its majestic colour, creates a lunch to make the soul soar. Preheat the oven to 200. Put the beetroot, onion, oil and water into a baking tray, season and cover with foil. Cook in the oven for 1 – 1 1/2 hours or until the beetroot is tender. Put the vegetables and any juices into a large pan, add the stock and blend with a hand held blender, alternatively blitz it in a liquidiser. Reheat when you are ready to serve it, check the seasoning and add a small blob of creme fraiche if you like. Serves 4.